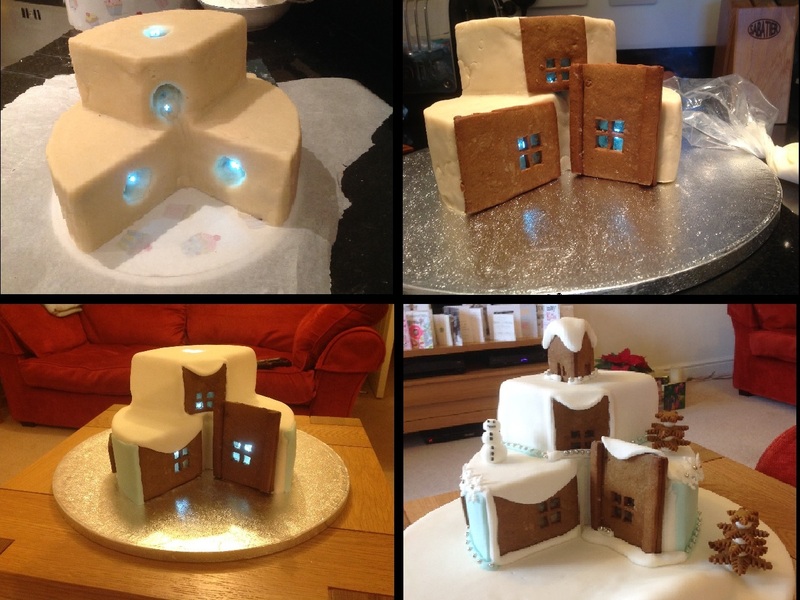 Last year I decided to make a slightly crazy Christmas cake, with lights and everything… and I’m not joking! I had seen a picture of this amazing cake and just couldn’t resist giving it a go. 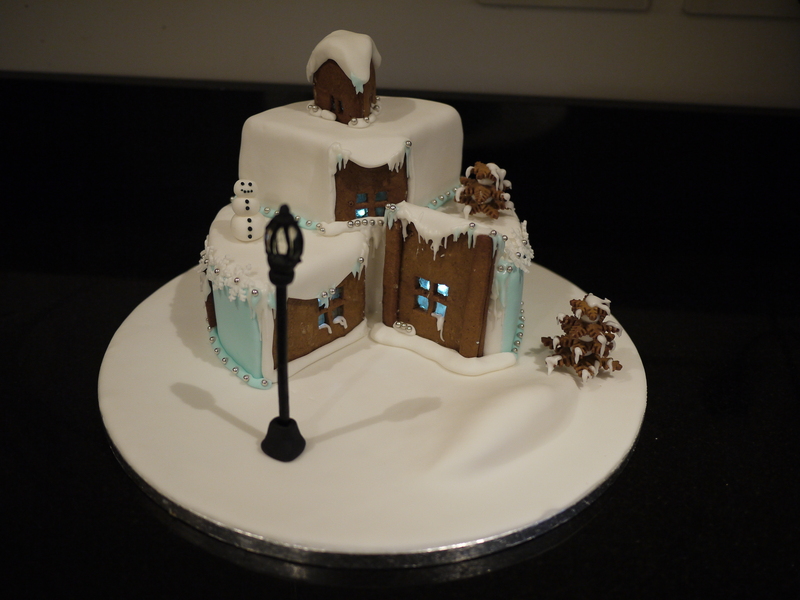 The style of the cake is what I imagine Mr Tumnus’s house looks like from The Lion, the Witch and the Wardrobe, so I thought I would to add a lampost too! I started by making a round 8″ fruit cake using Delia Smiths recipe. That was the easy part! I also bought some small LED lights with a battery pack. The rest was slightly experimental! Here’s what I did. I cut a quarter of the cake out and then hollowed out areas for where I wanted the window/lights to be. I found that I needed to make the holes quite big as they needed to be lined with fondant and be big enough to give the impression of space behind the window. I sliced the 3/4 cake and the 1/4 in half horizontally so I could insert the wires for the lights. Basically the light were laid down on the bottom half of the cake, then the top half put on top and the wire threaded up through the cake and up into the quarter of the cake that sits on top and then up out of the top of that too. The end of the lights with the battery pack came out the back of the cake at the bottom and the other end of the lights was the bit sticking of the top quarter. Next I marzipaned the cake using smaller pieces and covering each side and the tops with individual pieces which were smoothed together. Next step was to measure the size of gingerbread pieces I needed for the windows. It was rolled very thinly and then put on a tray in the freezer so it was really hard before cutting out the windows. These were filled with a small amount of crushed glacier mints before baking, these then melt to form windows. I also cut out several sized snowflakes from the gingerbread which I used for the trees. I covered the whole cake with white fondant and spent some time smoothing it on round the edge and over some of the gingerbread. I coloured some fondant with ice blue colouring, rolled some out to stick on the sides of the bottom of the cake. I used a large cake board and using a lump of fondant made a snow drift before covering with a single layer of fondant that was smoothed over the top. One it was dry and hardened I then placed the cake on top. 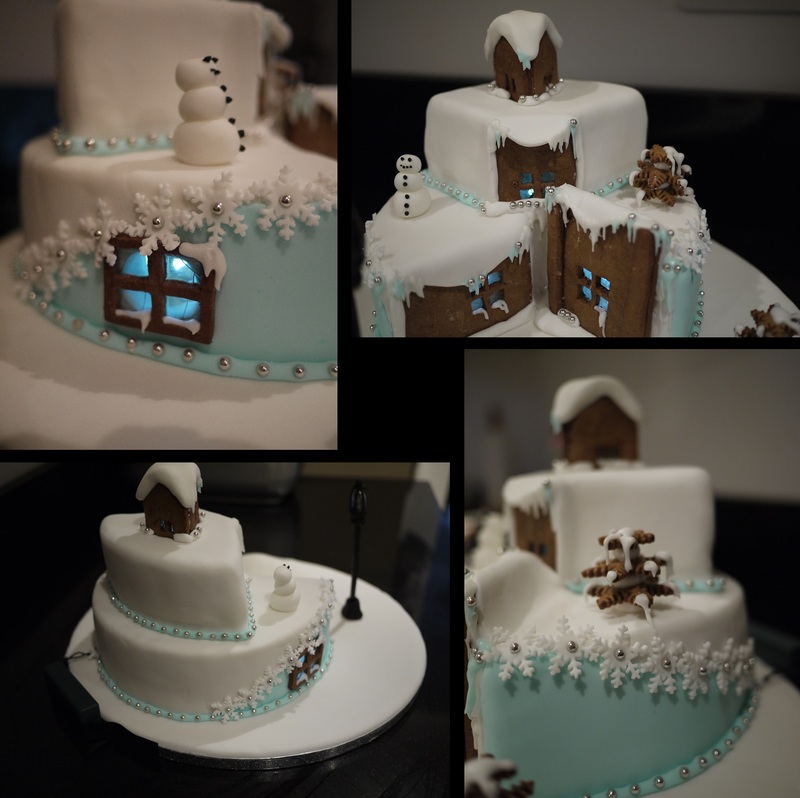 I began to put the finishing touches to the cake using various bits of fondant, fondant snowflakes, royal icing and silver balls as in the pictures. I assembled the gingerbread Christmas trees from the snowflakes and fondant and decorated with royal icing and then stuck them onto the board. I made the lamppost using white sugar cigarets that I stuck together and painted with black food colouring. 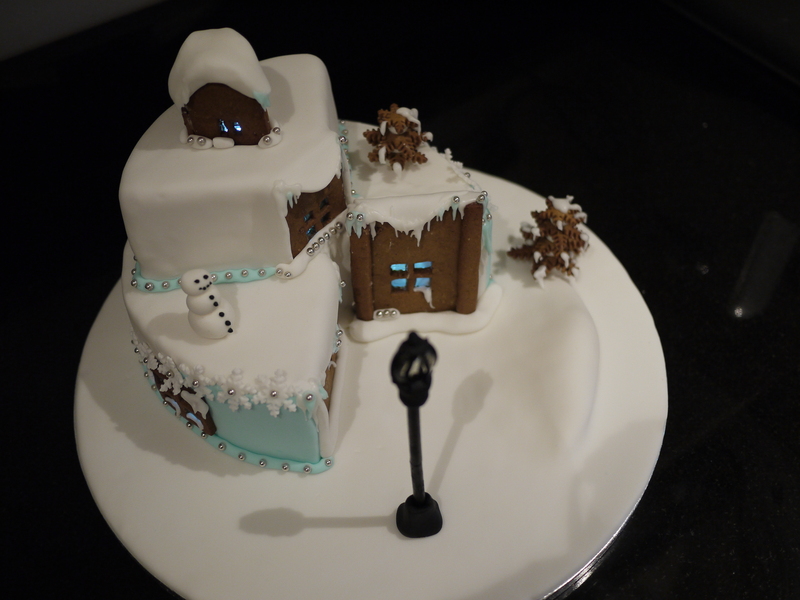 Then using black fondant and royal icing I secured a glacier mint in place for the light. Once it was all dried and solid I stuck it too the board with black fondant. Once the final touches were in place it was time to turn on the Christmas cake lights!